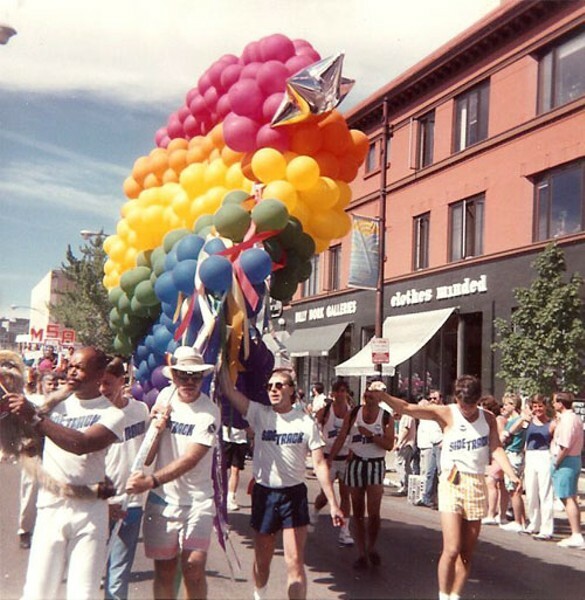 Chicago Pride Parade circa 1990. National Pride Month, established by Bill Clinton in 2000 as Gay Pride Month and recently rechristened by Barack Obama as Lesbian, Gay, Bisexual, and Transgender Pride Month, wraps up this weekend with the annual parade—this year taking place on the 40th anniversary of the Stonewall riots—as well as parties and other festivities. Backlot Bash This annual party in the parking lot of Cheetah Gym in Andersonville offers drinking, dancing, and live bands. This year's acts include Too White Crew (6/27) and Dot Dot Dot (6/28). Sat 6/27, 3-10 PM, Sun 6/28, 2-10 PM, Cheetah Gym, 5248 N. Clark, 773-728-7777, backlotbashchicago.com, $10, $15 Sat after 5 PM, 21+. Center on Halsted Pride Celebration Beer, wine, and soft drinks in the center's rooftop garden. Fri 6/26, 5-9 PM, 3656 N. Halsted, 773-472-6469, centeronhalsted.org, $15, includes three drink tickets, 21+. Chicago Pride Fest Now in its seventh year, Pride Fest offers arts and crafts, food, and live entertainment on two stages. Performers this year include the Chicago Gay Men's Chorus, Deborah Gibson, and Ultra Naté. Fri 6/26, 3-10 PM, Sat 6/27, 11 AM-10 PM, 773-868-3010, chicagoevents.com, $5 suggested donation. Pride Parade Attendance is expected to be in the hundreds of thousands for the 40th annual parade. It steps off from the corner of Halsted and Belmont and proceeds north on Halsted to its intersection with Broadway, south on Broadway, then east on Diversey to Cannon Drive. Transgendered actress and activist Alexandra Billings is the grand marshal. Sun 6/28, noon, 773-348-8243, chicagopridecalendar.org, free. Proud to Run Proceeds from this 5K and 10K run and two-mile "fun walk," now in its 28th year, benefit the Gerbert Hart Library and Pride Youth. Sat 6/27, 8:04 AM, 4400 N. Montrose, frfwchicago.org/ptr2009, $30 for 5K/10K, $25 for fun walk; sign up at registerPTR.com.